【Durable Construction】It is constructed of premium steel, fully painted cart can withstand rust and wear, a strong welding cart for your long-term use. 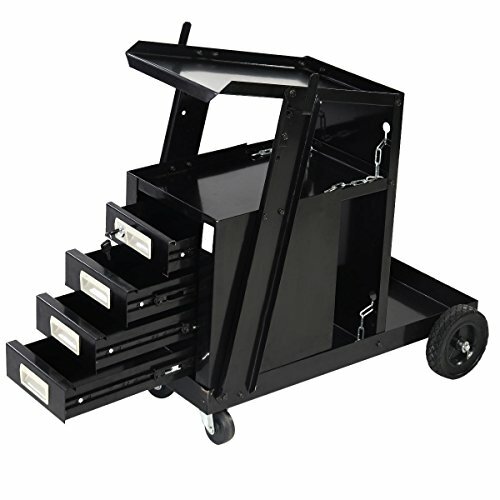 This sturdy and durable welder cart is ideal for MIG/ TIG/ ARC welders and plasma cutters. 【Four Sturdy Drawers】It designed with four sturdy drawers for storing your tools to be organized. Top drawer is lockable. 【2 Safety Chains】Back shelf for putting gas cylinder. Two safety chains to keep gas cylinder securely in place. 【Easy to Carry】This welding welder cart equipped with 4 wheels for easy moving from room to room. Two 2.5" universal wheels and two 6" fixed wheels. 【100 Lbs Weight Capacity】This welder cart can hold weight up to 100 Lbs. Ideal for both home garages and workshops.